This post may contain affiliate links. Please see my disclosure page here for more details. Peanut butter lovers, this one is for you. These Peanut Butter Cookie Bars are sinfully delicious. They just taste so darn good. I swear, it is hard for me to resist just eating one. Seriously, I just can’t do it. In fact, I’m already on my third batch this week because I can’t stop munching them! Growing up we never made peanut butter cookies because my sister is allergic to nuts. I remember the first time I ever ate a peanut butter cookie I was in high school. I went over to my best friend’s house and we whipped up a batch. We followed the recipe on the back of the peanut butter jar. And Oh My Goodness! I couldn’t believe how good peanut butter cookies were! *So sorry, sis, this one just ain’t for you! These Peanut Butter Cookie Bars have such a great texture. They are just the right amount of soft and chewy. The peanut butter flavour is right on. And my-oh-my does it ever go down well with a large glass of milk! These cookie bars are so easy to whip up. 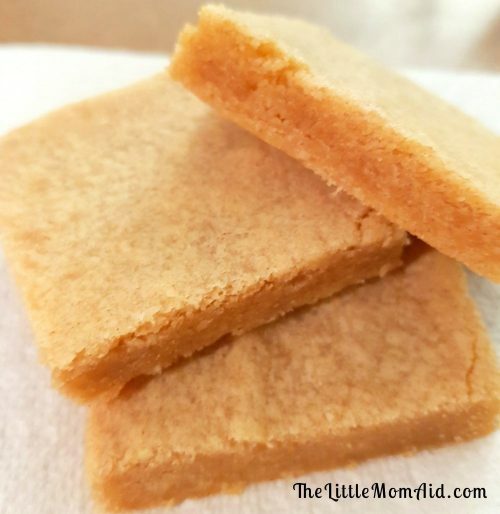 With a new baby and a toddler I need quick and easy recipes and these Peanut Butter Cookie Bars fit the bill. They are just so dang easy to make! First, using your electric mixer combine the melted butter and the sugar. Second, Then add in the egg, vanilla extract and peanut butter. Third, sprinkle in the salt and toss in the flour. Mix it all together for a minute or so. You will have lovely peanut buttery dough. Friendly tip: You may want to gently mix in the flour with the batter before turning on the mixer. You know, to prevent a cloud of flour from rising from the bowl! Now, spread the dough evenly in the prepared baking dish by patting it down with your hand or with a spatula. Don’t have time to make these now? Don’t worry! Just Pin it for later! Have you tried these Peanut Butter Cookie Bars? If you tried out this recipe let me know! I would love to hear about it so leave me a comment! You can also tag me on Instagram @thelittlemomaid or use the hashtag #thelittlemomaid. Preheat the oven to 350F. Line a 13×9 baking dish with parchment paper. With an electric mixer, combine the butter with the sugar. Next, add in the egg, vanilla extract and the peanut butter. Then add in the flour and salt. Mix until everything is combined. Transfer your dough to the prepared baking dish and spread it evenly. Press the dough using your hands or a spatula. Bake for 20 minutes. Remove from the oven and let cool in the baking dish on a rack. Let it cool completely before cutting. Oh my yum!!!! I think I’m drooling! Can’t wait to try these! These are so simple. Can’t wait to try! These look amazing and sooo easy! I love finding recipes like this, thanks!